We’ve all seen restaurants take advantage of this trend, now it’s your turn. 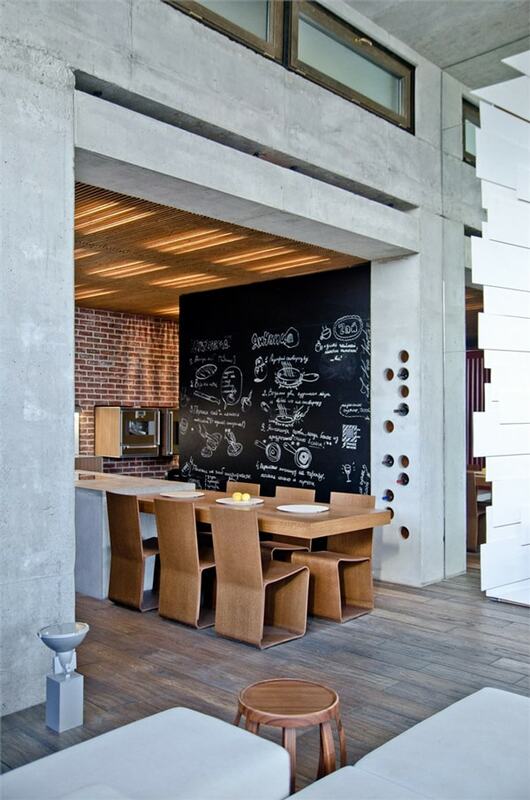 I’ve long been a fan of chalkboard walls in dining areas – what a great way for guests to “sign in” and for the chef to boldly showcase the upcoming menu, but even if the wall is in a private family dining spot, the interactive ability just makes the whole experience of family get togethers around the table so much more fun. 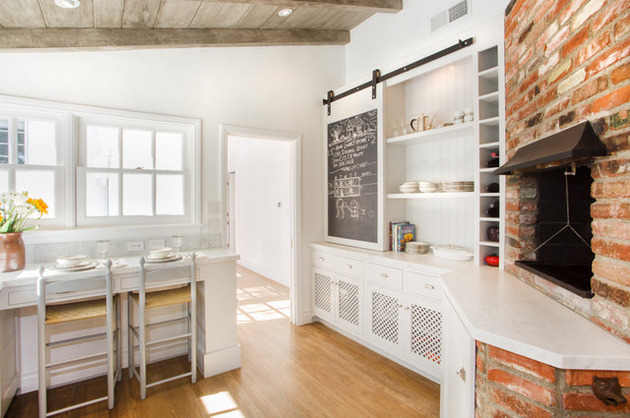 See how the architects integrated this wall into the rest of the home. 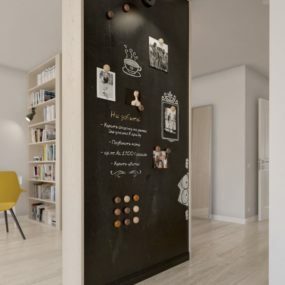 Chalkboard walls don’t have to be limited to uninterrupted surfaces; here the architect has painted not only the wall but the shelf supports, storage cubbies as well as the baseboards for a final result that is rather awesome. I love how the matte black wall allows the pale pastel green in the bar stools to pop even though the rest of the walls are white. 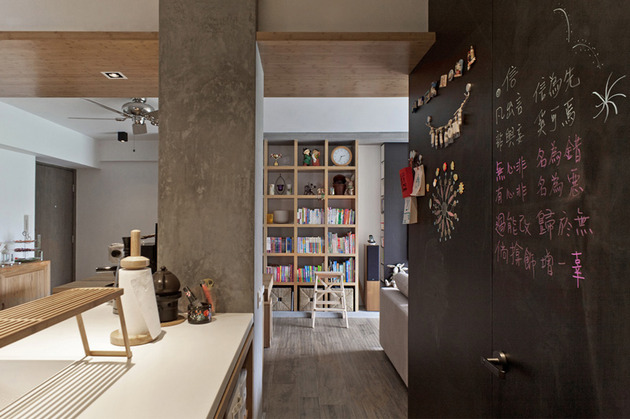 It’s a fun and lively moment that totally integrates with the rest of this small home. 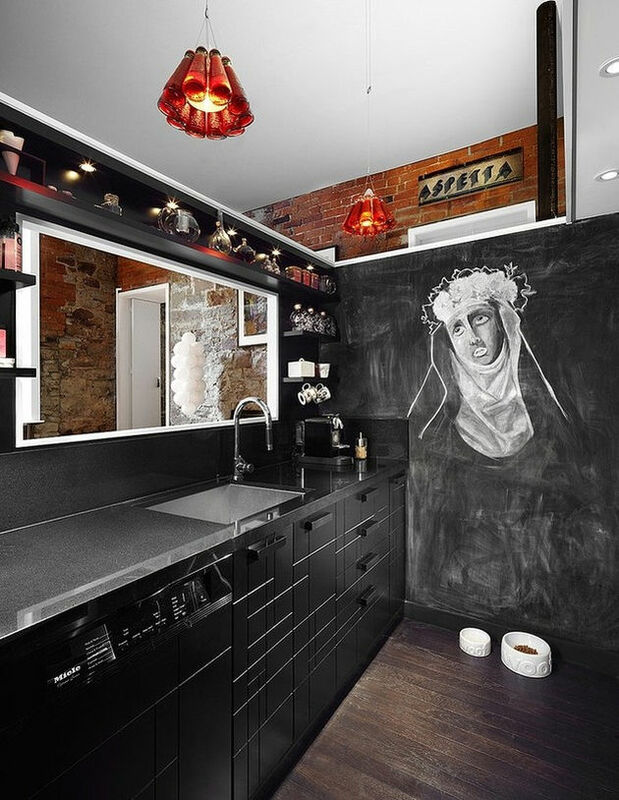 Usually when we think of chalkboard drawings casual images and text comes to mind but there is nothing casual about this renaissance style sketch created on this chalkboard wall. What makes it even more dramatic is the black on black color scheme with only the chalk and dog bowls layering in the white. Its an odd juxtaposition but does it ever work. 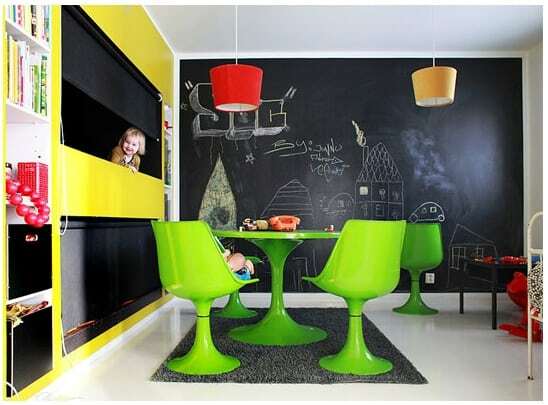 What’s really cool about this chalkboard wall is how you can see it in the living room through the wall cut out. 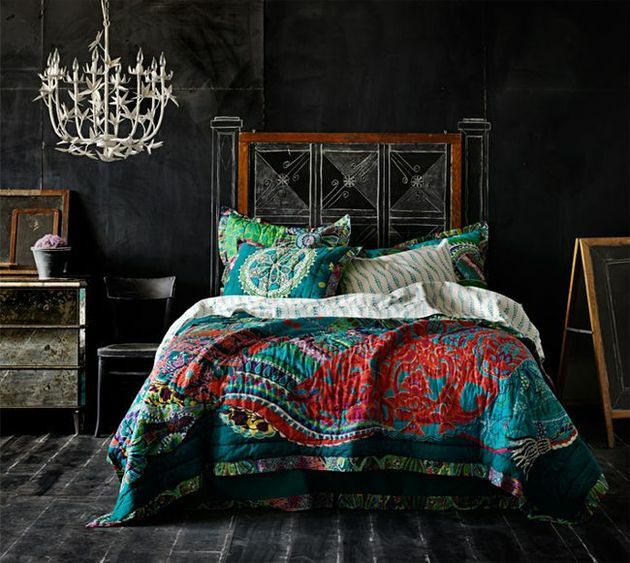 Check out this art loft design in detail. 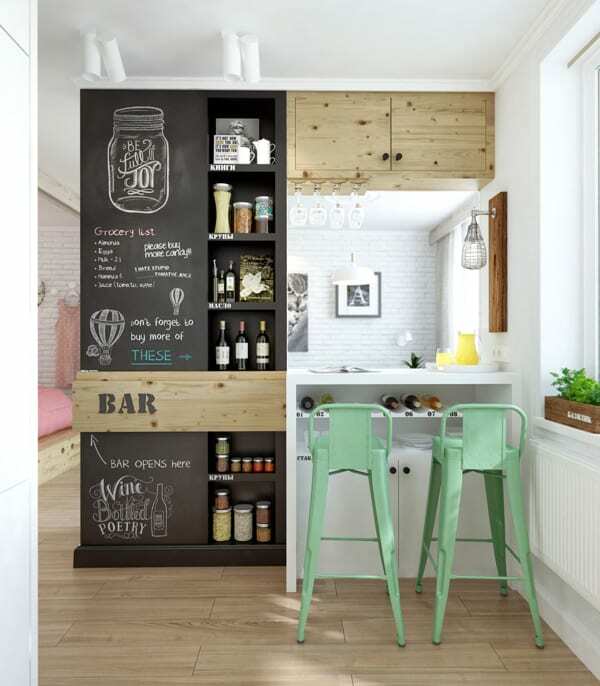 If your kitchen prep space is on an island overlooking a wall, chalkboard paint is a great way to add personality to that wall. 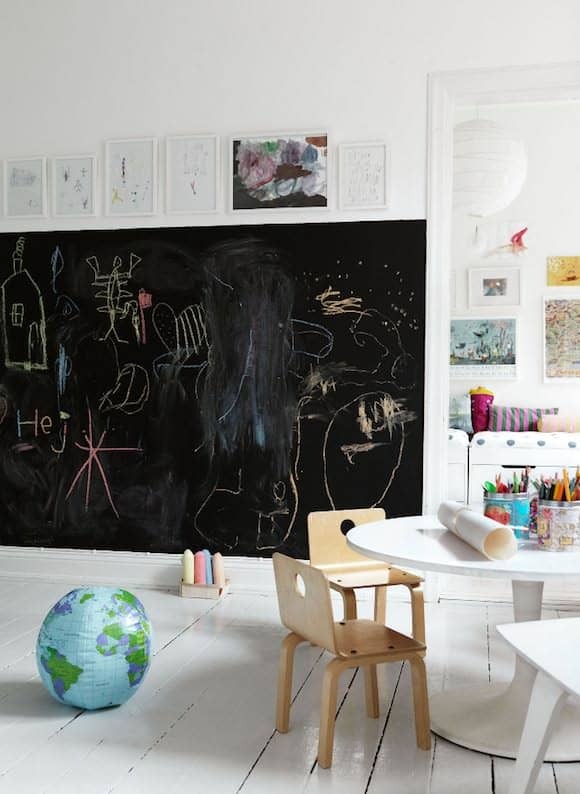 You can accessorize the wall by painting magnetic paint beneath the chalkboard paint so that you can use it for both chalk and magnets. Doors on the wall? No problem paint right over them with only the door handle left exposed. 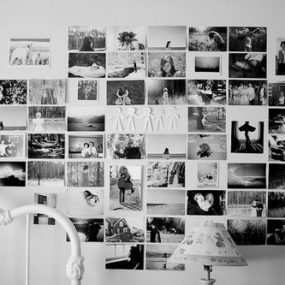 This wall is such a chic addition to the apartment, and check out the rest of this small space. 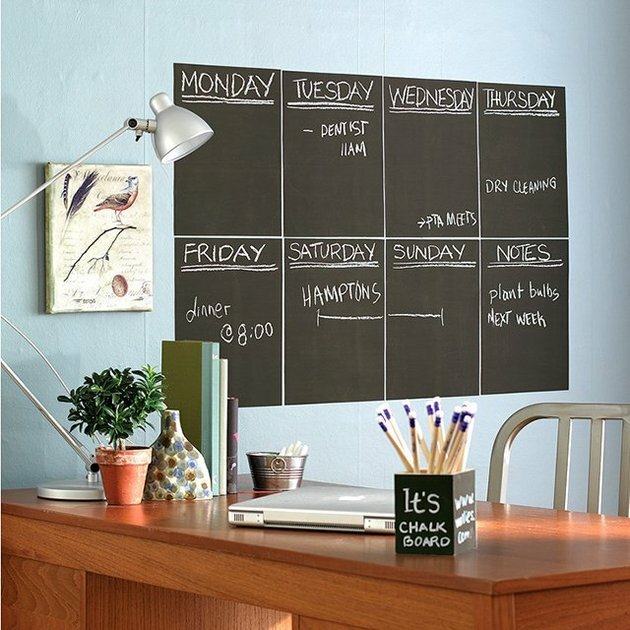 Chalkboard is a great way to create a shopping list and what better place to create a chalkboard graphic then right on the fridge where you can jot down supplies as you discover that you need them. 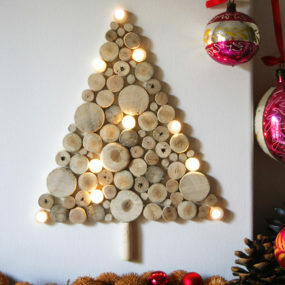 To see this photo’s source link click here. Living Rooms are places for friends and family to gather and communicate, so why not get the conversation flowing with a great chalkboard conversation piece? It doesn’t have to be a Rembrandt or Renoir; it just has to represent who you are. Living Rooms are traditionally a place to showcase favorite art items but when paintings are hung on a wall in a small room its easy to knock into them – even slim profile ones, but if the art is chalk on paint, it not only takes up less space but is totally customizable and totally changeable and with today’s love of font art it doesn’t even have to be a picture. You can see the rest of this space saving design. 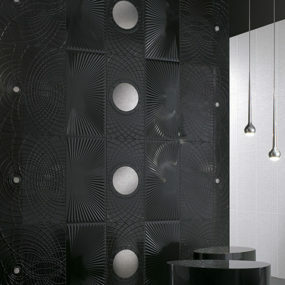 While blackboard walls are usually complete walls, they don’t have to be. 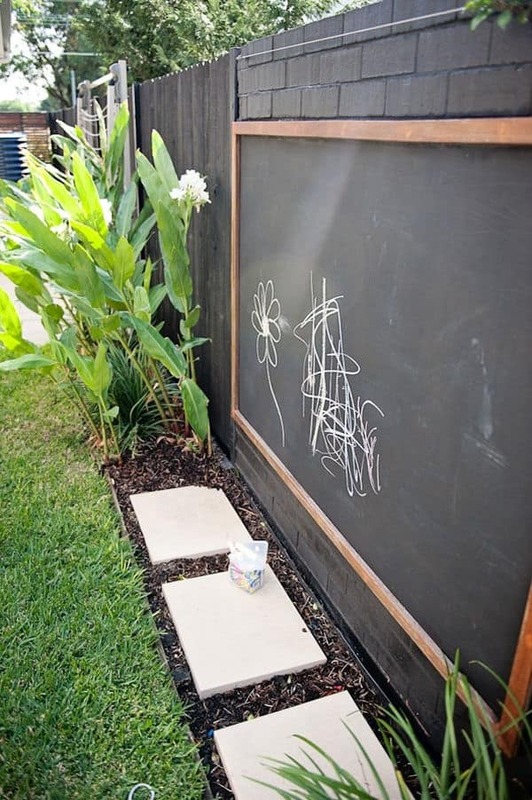 Any shape can become a blackboard moment, but rectangles are the easiest to create. Simply use four strips of painters tape to create the rectangle and roll the paint within the tape to create the shape. When done a painted frame can be added – or not, its up to you which look you like better. To see this photo’s source link click here. 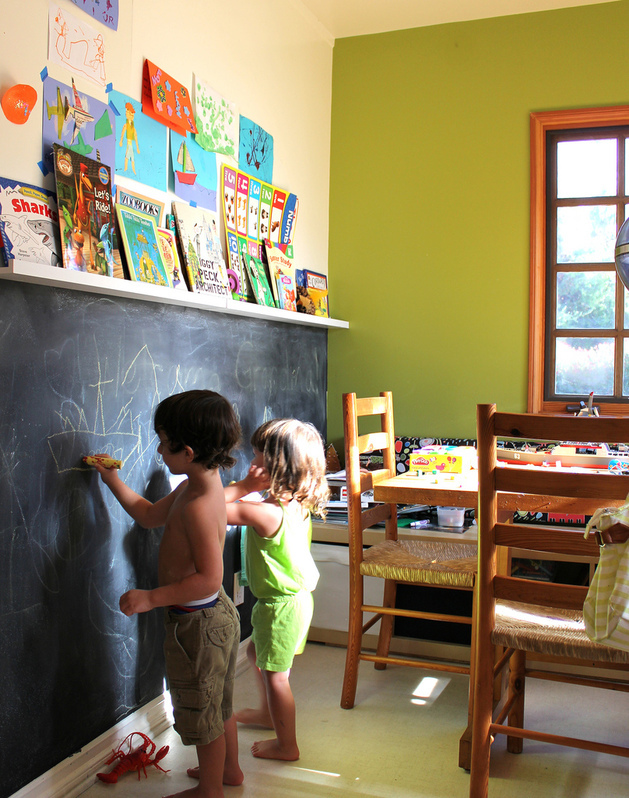 Chalkboard walls aren’t just for wide-open spaces; nooks, niches and closets are great candidates for them as well. 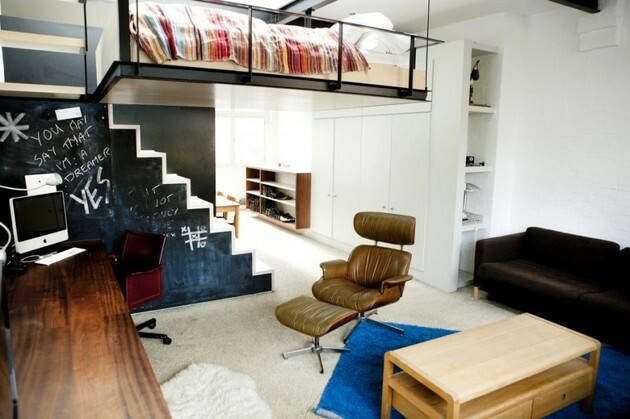 Ever thought of turning a closet into an office or craft room but was worried that the space would be too dark? 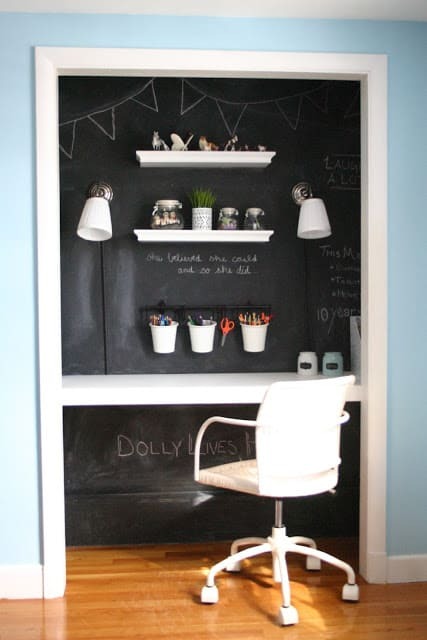 This chalkboard closet proves that black does not mean dark, just look how the white desk, shelves and accessories pop in an oh so lively vignette and the addition of the chalk phrases on the wall take it to a whole other level. As the chalk says “Home is where the heart is” and I heart this closet! This isn’t the only chalkboard moment in this home and to see the rest click here. 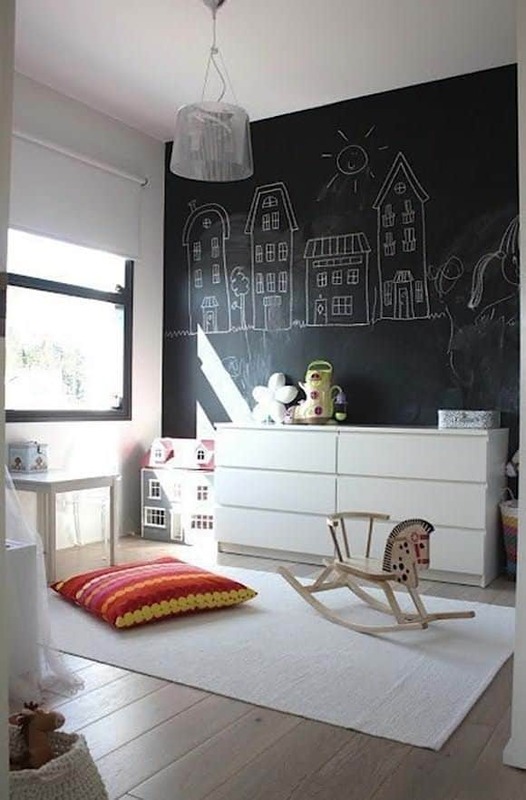 Kids love drawing with chalk and what better way to let them express themselves than with their very own chalkboard wall in their very own room. You will be amazed at their artistic abilities and it might even make you want to join in the fun! 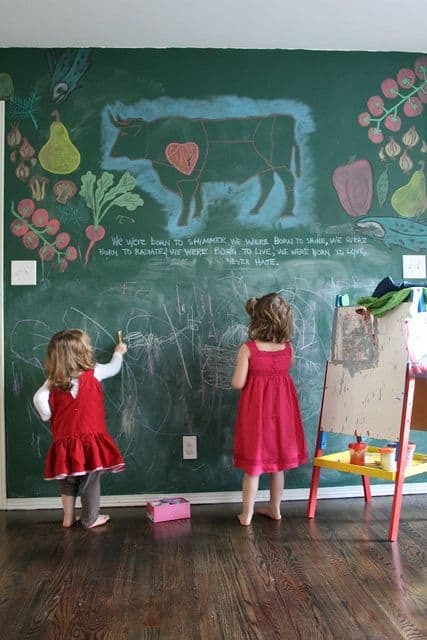 A chalkboard in a child’s mind is a piece of freedom, a wall where they are allowed to create masterpieces – as opposed to mom’s kitchen wall or the hallway! It is a place where they can unleash their inner creativity held in check only by the size of the wall, how high they can reach and the colors of chalk available. To see more examples of kids chalk walls click here. 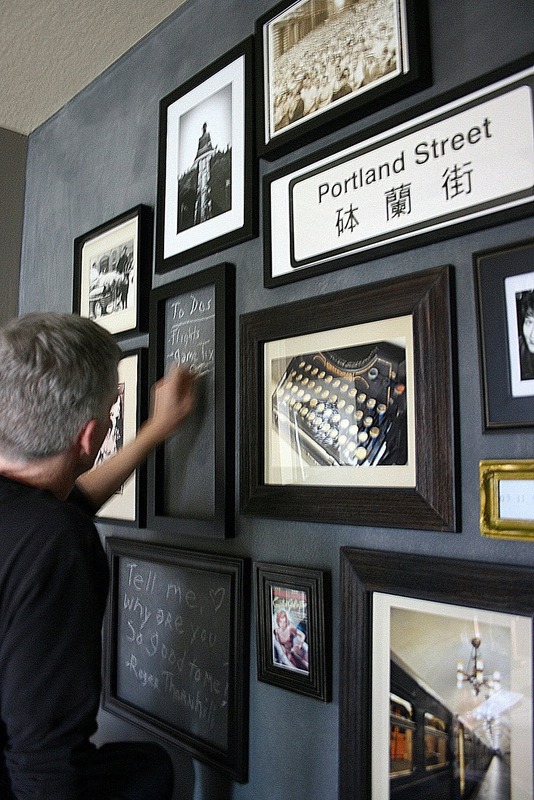 There are so many different ways to introduce Chalkboard details into your home. 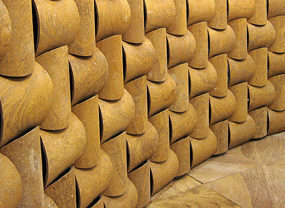 You can cover an entire wall or just parts of one. 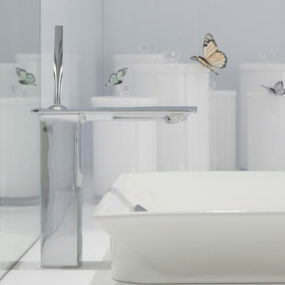 You can create simple shapes or complex designs and you can use paint, tiles or vinyl decals. Whichever direction you choose to go, your friends are sure to be impressed with your DIY skills – just don’t tell them how easy it was! 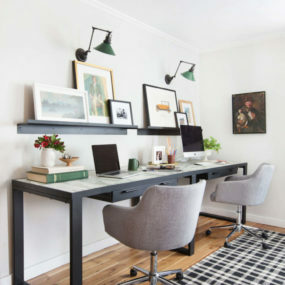 Chalkboard walls are created with paint – that’s it – every paint store carries the chalkboard paint and necessary supplies and all you have to do to create your own wall is buy the supplies, do the right prep work and get painting. If you want to impress your friends and family with your own DIY chalkboard wall, don’t rush, don’t skip steps and don’t chicken out! To see how this wall was created click here. 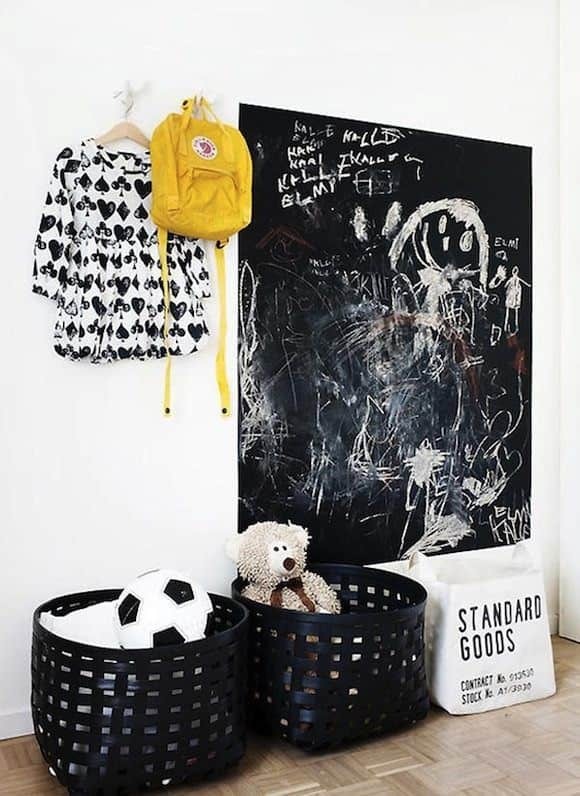 How fun would it be to create a chalkboard painting with its own frame, its own storage bins below AND the additional feature of being magnetic as well as chalkboard. What a great play station for kids to use and it’s so easy to make yourself. To find out how click here. If you’re hesitant about painting directly onto your walls with chalkboard paint because, say you’re renting, then consider painting removable tiles. When you move, so do the tiles. Love these 9″x12″ blackboard tiles creating a weekly flowchart, what a brilliant idea, so much better then Post It’s! For more information click here. 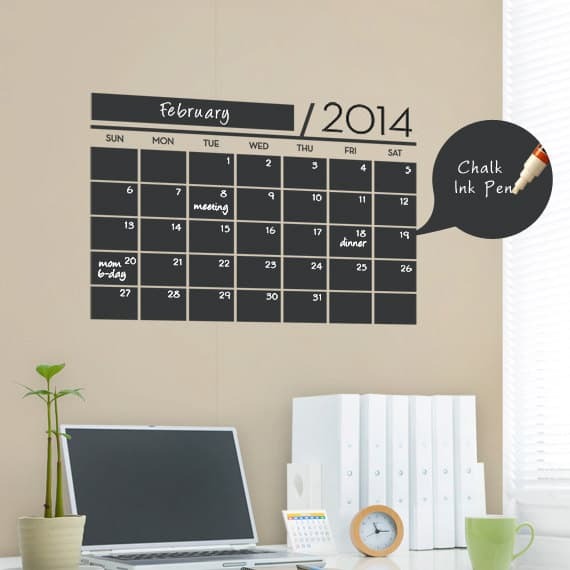 There’s something almost beautiful about a calendar graphic, maybe it’s the geometry of it or maybe it’s the way it causes us to stop, pause and reflect on what was and what is to be, either way creating wall art with chalkboard vinyl stickers in the form of a calendar is not only beautiful, but functional as well. It’s also easy to adjust as one month shifts into another, simply peel off the ones that need to change and re-stick. If you like this idea and want to know more, click here. So many of us have purchased small bulletin boards or magnetic boards or chalk boards for our offices and found that they are too small. Instead of hanging a store-bought board on your office wall, think big and paint a complete wall with chalkboard paint. 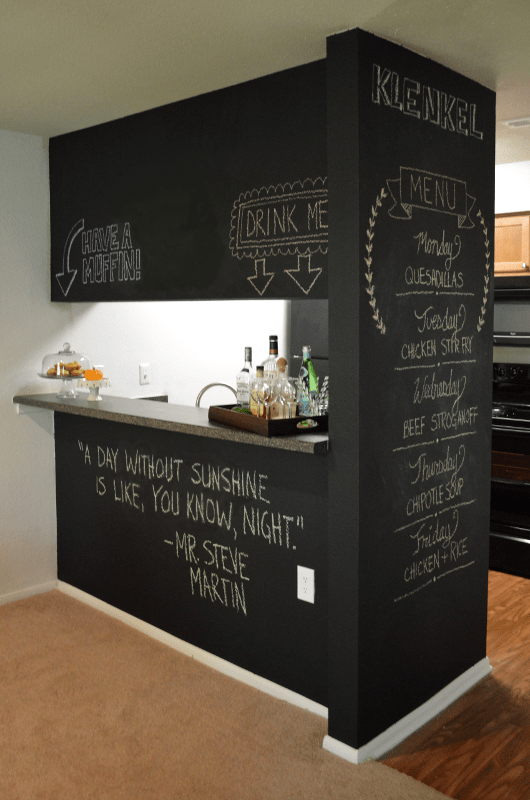 Finished basements are the perfect place to let loose and have some fun, and what better way to spice up the walls in a basement then with chalkboard paint. 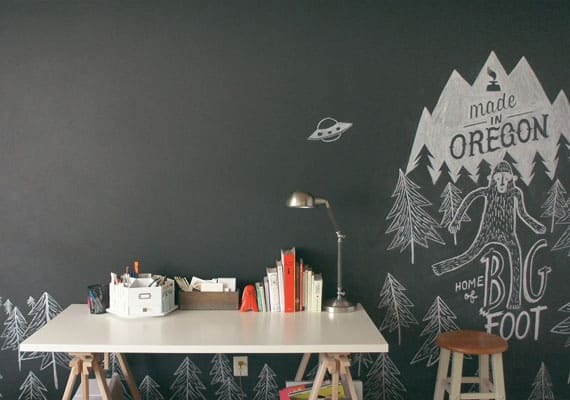 Bedrooms are spaces that lend themselves to being highly personalized, which makes them the perfect place for a little chalkboard wall creativity. 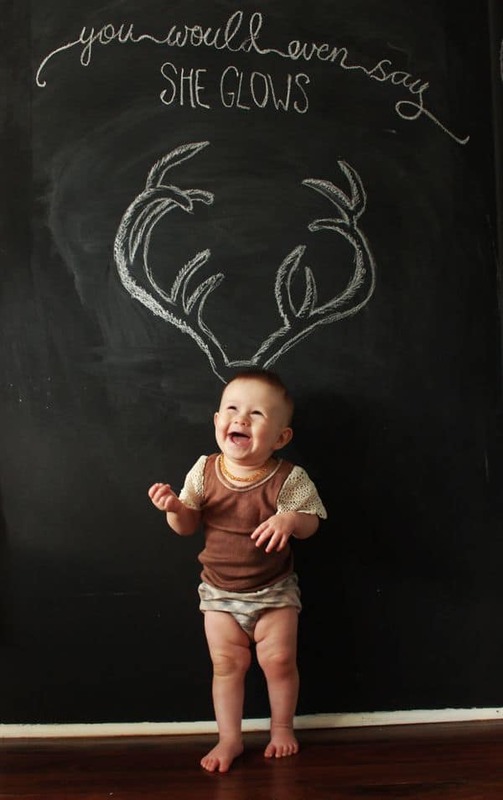 Go wild and have fun, life’s too short to be timid. 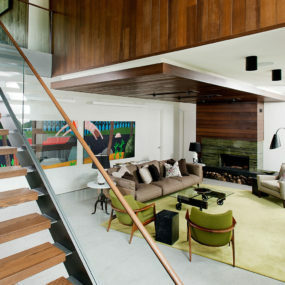 Foyers are usually not that big but need to serve multiple functions. It’s the first thing people see when they visit and you need a place to store coats, shoes, umbrellas, keys – the list goes on. There’s so much function to this area of your home that the decor often suffers. Time to change that. Paint a wall with chalkboard paint and create a foyer that will leave your guests amazed, talking about it and wanting one of their own. 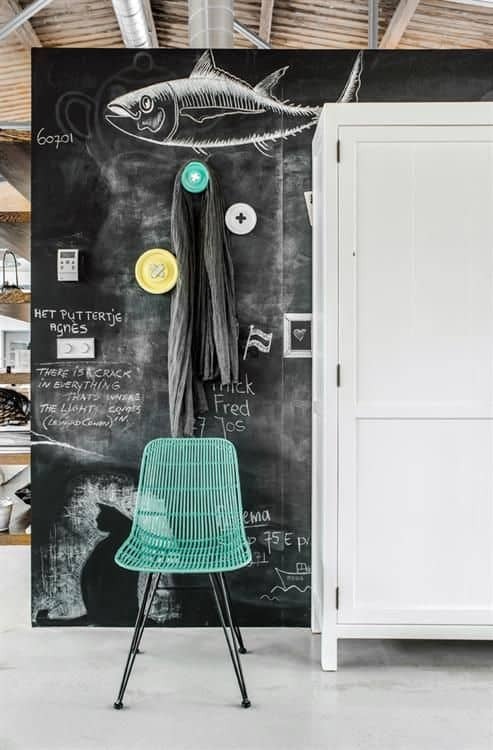 What a great chalkboard wall for a foyer in a beach house or vacation home. Instead of hanging a taxidermy fish on the wall, they drew one instead, so much more ocean friendly, and check out the whimsical coat hooks that look like giant buttons, love it. To see this photo’s source link click here. We all know the health benefits of fresh air and that its good for kids to get some play time outdoors, but what about getting creative time outdoors as well. 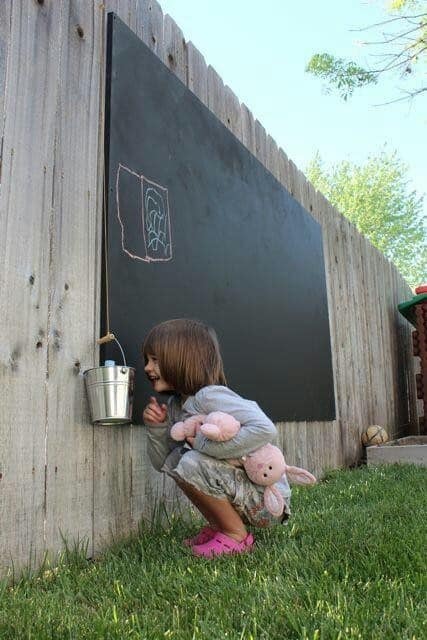 Artists love painting plein air and so why not install your very own plein air chalkboard wall. Chalkboards are all the rage and even celebrities are embracing the concept of chalkboard creativity, and why wouldn’t they? 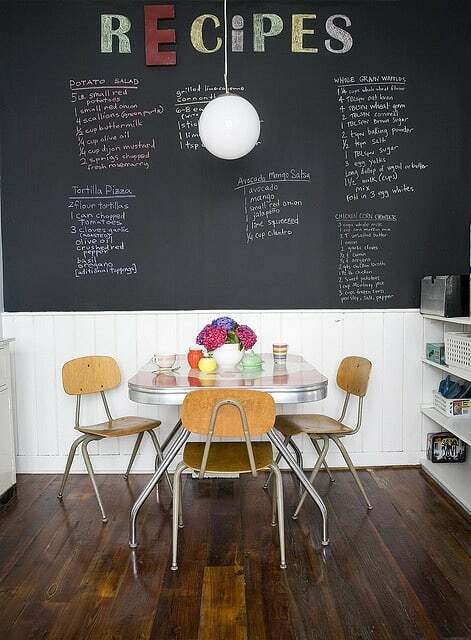 Chalkboard walls are super fun, super stylish and a great way to personalize a space no matter what your budget is. Gwyneth Paltrow is known for her expensive taste, but even she knows that things don’t have to be expensive to be perfect. 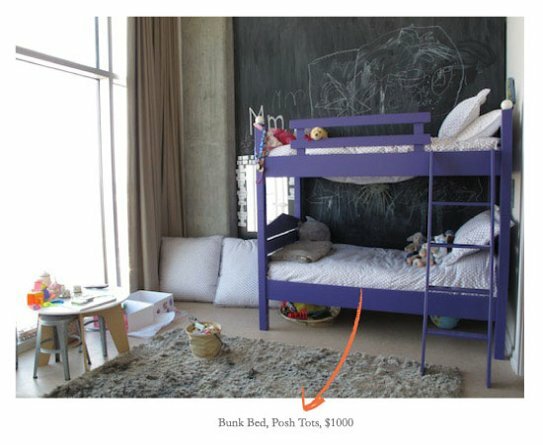 Take the room her two kids Apple and Moses share, it’s a beautiful child’s room that just happens to feature a chalkboard wall, and don’t the purple bunk beds just pop against the black? To find out more click here. Chalkboard walls are stunning on their own, but they can also be part of a larger picture whether by layering or by being part of a larger vignette. 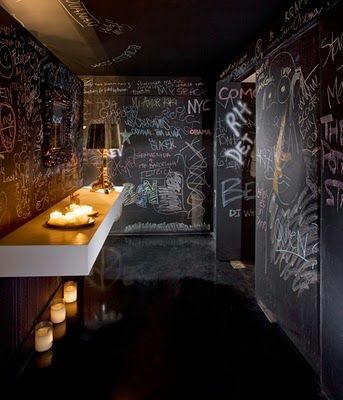 Either way the creativity of chalkboard walls is limited only by your imagination. Have you ever hosted a large party and wished their was some way of creating a guest book that was not a book? Next time you’re planning a big event consider creating a chalkboard wall for all your guests to sign, draw, or write on, you’ll be glad you did and you’ll be remembered of how much fun it was every time you walk by it. To find out more on this project click here. There is nothing better then a headboard wall that is treated as a complete feature package whether by a wall graphic, or in this case by a chalkboard wall. 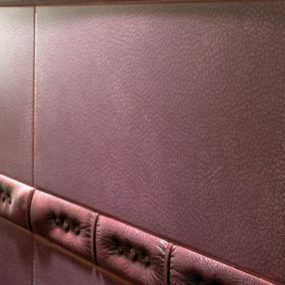 The beauty of headboard walls is that they can be as busy and/or dramatic as you want because you don’t see them when you’re in bed trying to fall asleep. Can’t sleep? 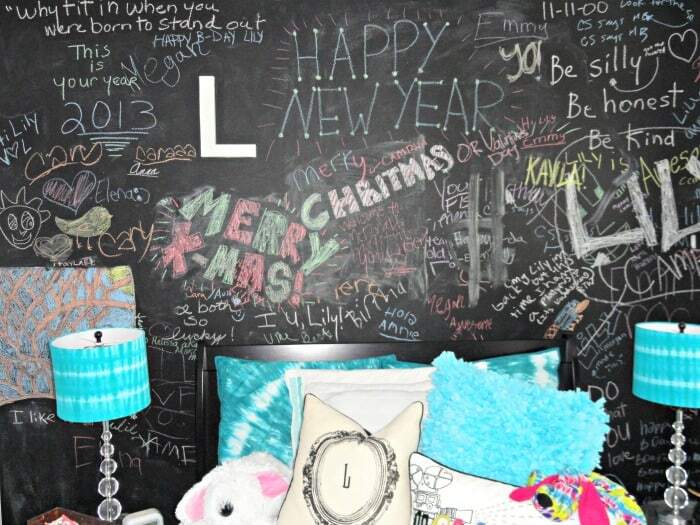 Pick up the chalk and express yourself without even getting off of your bed. To see this photo’s source link click here. In Real Estate location is everything and the same can be said about chalkboards. 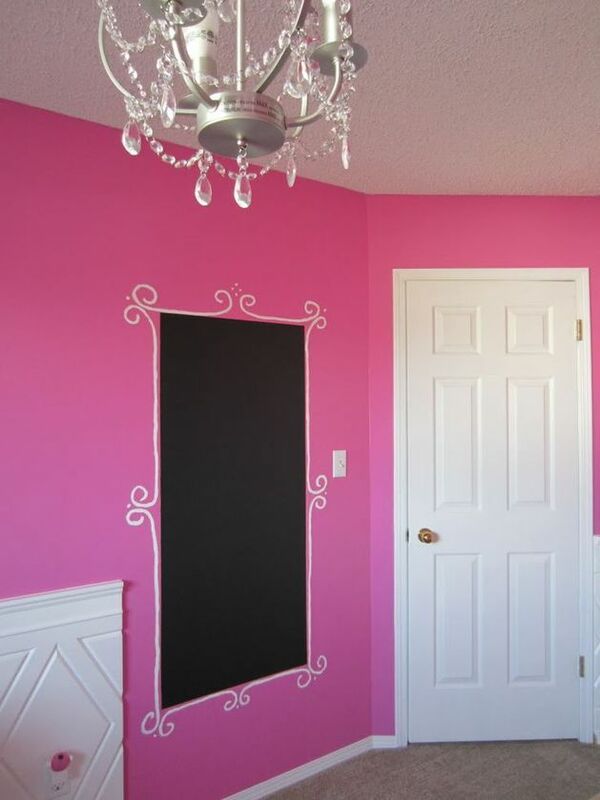 Chalkboard walls are awesome but really, chalkboard paint can be applied to almost anything and can take something average looking and make it the feature of the room. 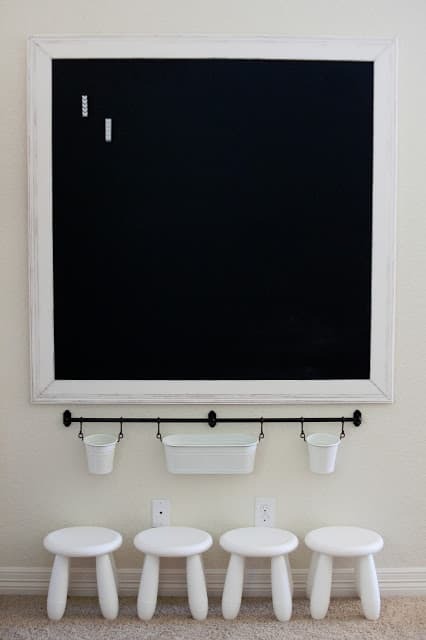 Chalkboard paint is a fantastic way to add personality to any space and all you have to decide is what and how many locations you want to use it in. 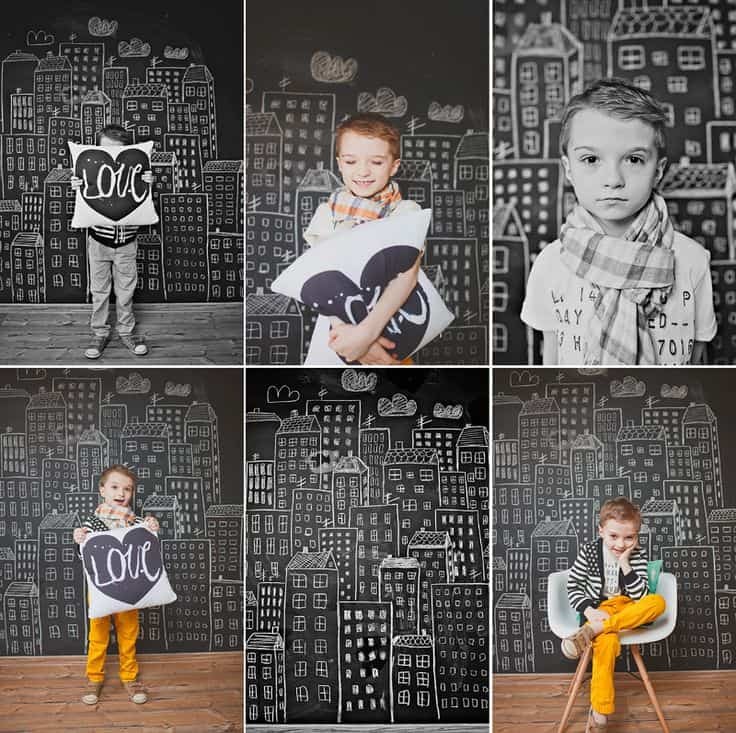 If you are creating a chalkboard wall for your kids to use then painting the wall all the way up to the ceiling is not necessary, consider painting it to the height of a fireplace mantle and installing a floating shelf above it to display additional kid creations of the more traditional paper variety. To see the full story on this project click here.